Social media content posted by brands appears to influence consumers' buying decisions nearly as much as content posted by friends, according to a survey from Market Force Information. 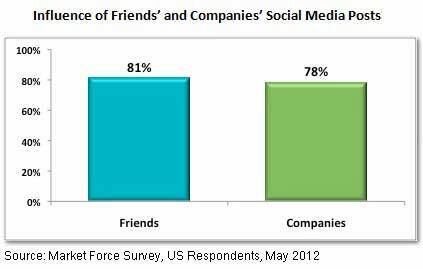 The new Market Force survey asked socially networked adults if they had read comments, tweets, or other social media content posted by friends or businesses (restaurants, retail, travel, entertainment, or financial services brands) in the previous 90 days. Among US consumers who had consumed content shared by friends, 81% said such posts influenced their purchasing behavior moderately or highly. Among consumers who had consumed content posted by brands, a comparable proportion (78%) said such posts influenced their purchase behavior moderately or highly. Below, additional findings from the Market Force Information survey of consumers in the US and UK.